3/4 pound bacon (may need more or less depending on the size of your pork loin). First, cook the pears in the butter in a large skillet, adding the cinnamon about half way through the cooking. Sometimes, it’s tasty to let the pears caramelize, which should take about 4-5 minutes per side over medium high heat. It’s also good to just soften the pears up, which you can do over medium heat, stirring somewhat frequently. Let the pears cool before proceeding. While the pears are cooling, render some of the fat from the bacon. You can do this in an oven, or just cook the bacon in a skillet until it is about 40-50% done. You want it to still be limp and have most of its fat, but just get the fat-shedding process going. Let the bacon cool. Next, you’ll need to cut the pork loin. We’ve tried to explain this method before, but a visual aid is much more helpful – here is the same YouTube video that we always link to: How to Prep Meat for a Stuffed Pork Loin. Season the inside of the pork loin with salt and pepper. Flip it over and season the outside with the blend of salt, white pepper, and coriander. Go ahead and preheat the oven to 375 degrees. Arrange the bacon slices in a roasting pan to cover the bottom of the pan, with the bacon slices all laying the same way. Lay the pork (coriander side down) perpendicular to the bacon slices. 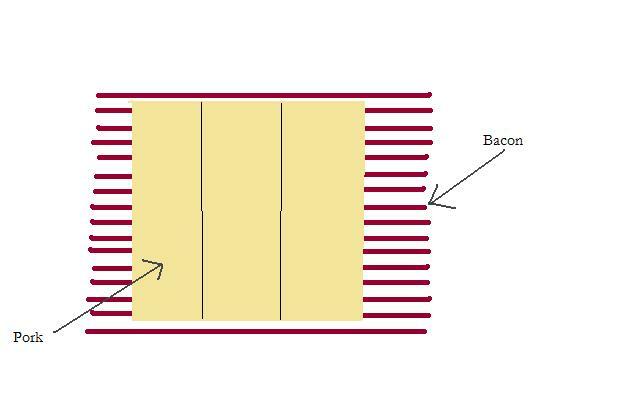 (The bacon should be overlapping, so that it’s a solid sheet, but the picture has the bacon separated, just to make it more clear). With the pork loin open in front of you, spread the pears out evenly. Sprinkle the brown sugar over the top, and roll the pork loin up like a swiss cake roll. 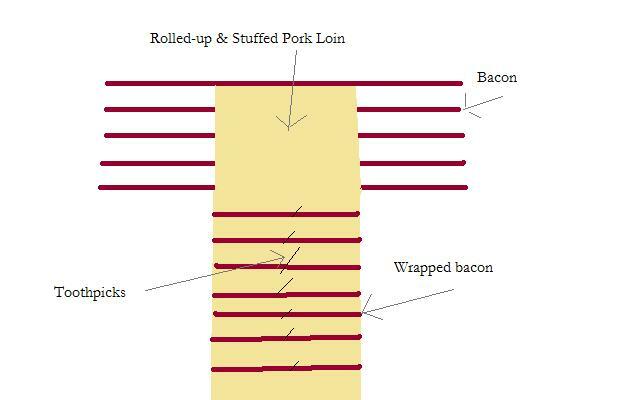 Piece by piece, take each strip of bacon and wrap it around the pork. 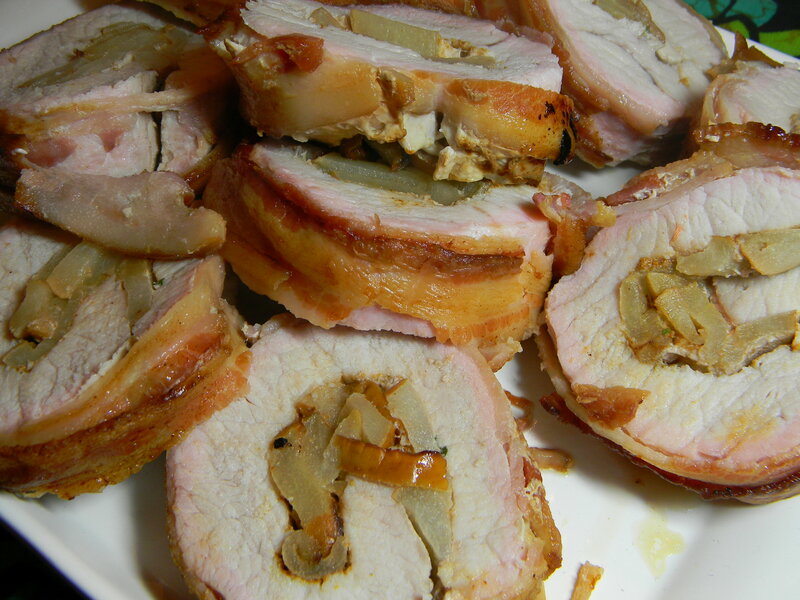 Use a toothpick to hold the wrapped pork in place as you work down the line of bacon strips. 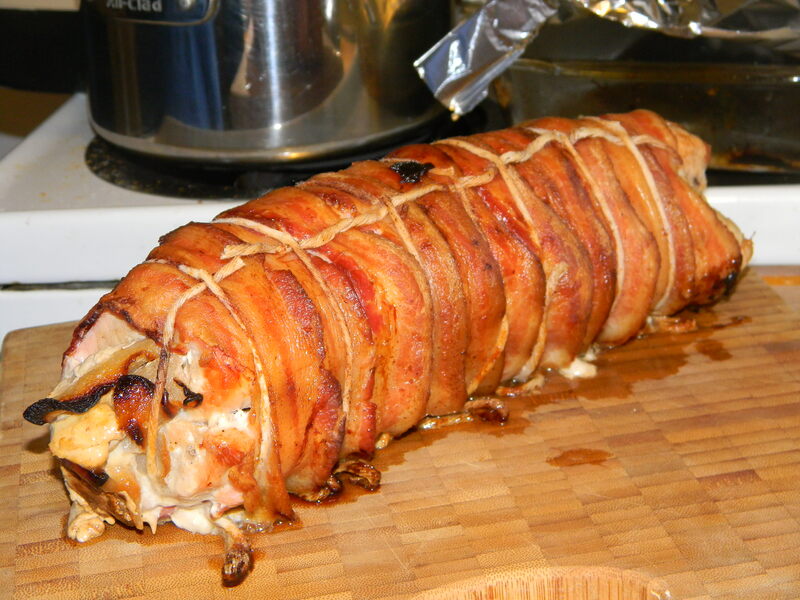 (Again, the bacon should be overlapping and completely covering the pork, unlike the picture). 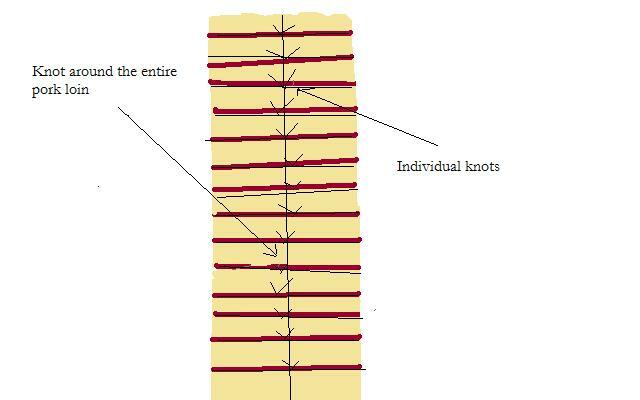 Finally, use kitchen twine to tie up the roast- first around the entire loin, then use individual knots to tie the roast parallel to the bacon. Thankfully, that’s the last terribly drawn paint picture you’ll have to look at in this recipe. (And, the other good news is that you’ve successfully tied your roast!) In the same roasting pan, place it in the oven for 45 minutes to an hour, or until a meat thermometer reads 145 degrees – 150 degrees. Depending on the size and thickness of your pork loin, this time could vary substantially. Remove the pork loin from the oven and let it rest for 10 minutes. Using a very sharp knife, slice into one-inch thick slices, serve, and ENJOY!